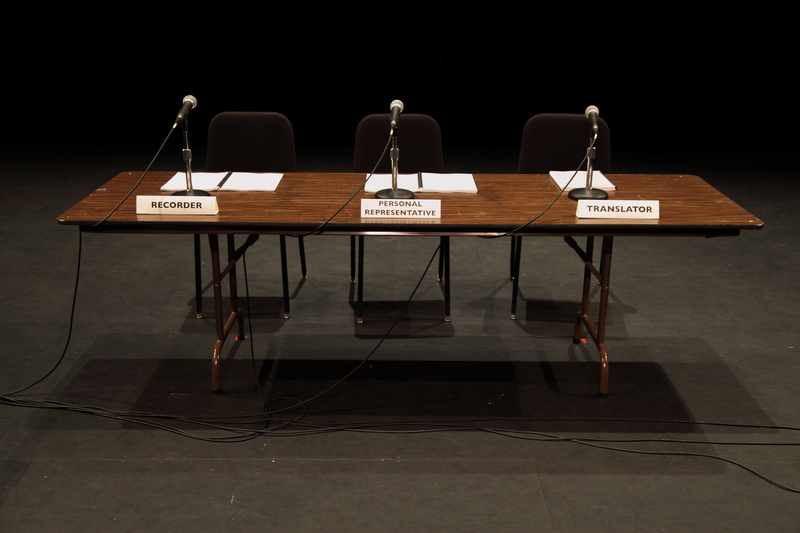 The performance comprises a four-hour public reading of unedited transcripts from 18 Combatant Status Review Tribunals held at the U.S. military prison camp in Guantanamo Bay, Cuba, between July 2004 and March 2005. During the public performance nine readers rotate through eight juridical positions. The artist group—consisting of Andrea Geyer, Sharon Hayes, Ashley Hunt, Katya Sander, and David Thorne—understands the performance as a simple yet vital gesture towards making these tribunals public. Readers for performances have included Jane Anderson, Homi Bhabha, Yve-Alain Bois, David Deitcher, Cynthia Chris, Anna Deavere Smith, Allen Feldman, Judy Greene, David Deitcher, Christian Hunt, Justine de Penning, Lawrence Grecca, Lisa E. Harris, Allan Hunt, Sam Durant, Michelle Dizon, Wu Tsang, and Suzanne Hunt, others. This project is part of 9 Scripts from a Nation at War.